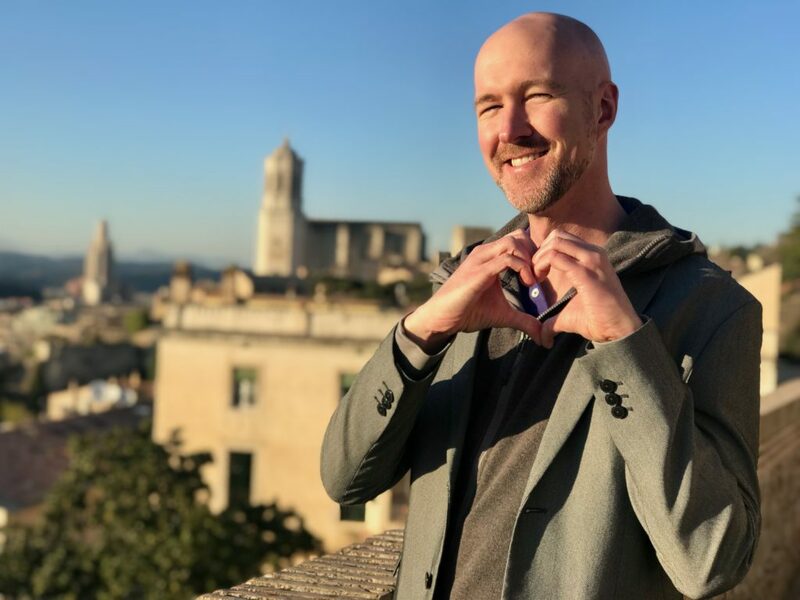 While planning our trip to Spain, Curtiss was so excited to spend Valentine’s Day in Girona. 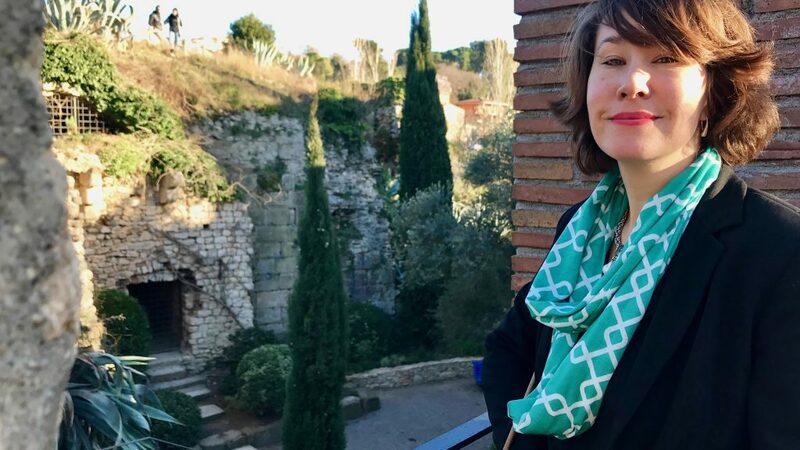 He visited this Venice-like town many years ago on a solo trip — before the joy of knowing me — and it has always stuck in his mind as a highly romantic town. Who am I to come between a man and his romantic inclinations?!?! We’re so romantic that we didn’t just celebrate Valentine’s Day. We celebrated Valentine’s Day week! Curtiss visited Girona yeeears ago when he was traveling solo. 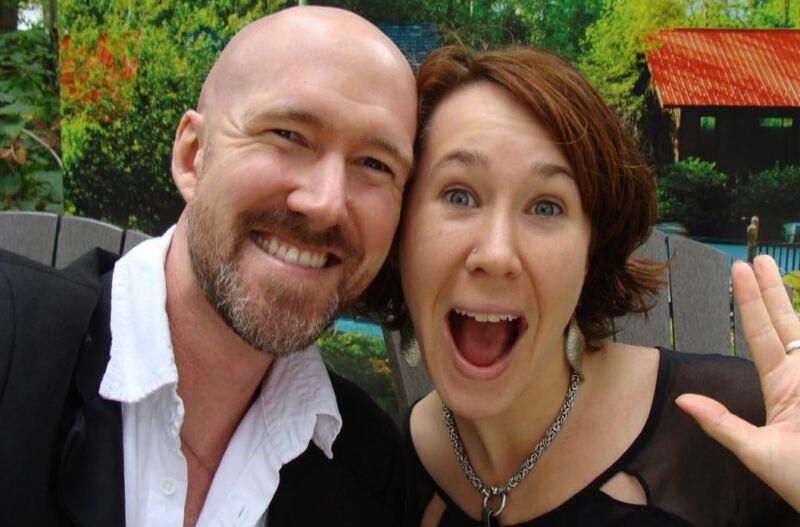 It felt like such a romantic town, and then… tada! Girona is an easy 40-minute train ride from Barcelona. On the ride there, be sure to look out the left side of the train for an easy view on the majestic snow-capped Pyrenees Mountains. We suggest staying in the historical center, or Jewish quarter of the city, where you’ll find winding cobblestone streets, cute boutique shops, and cafés galore! 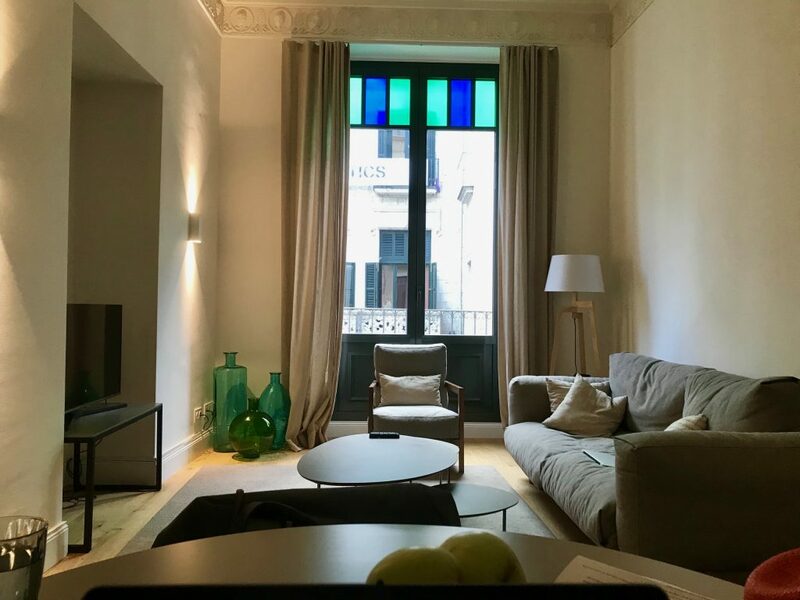 We were completely thrilled with the place we stayed, stocked with a full kitchen, washer, dryer, etc — Apartaments Plaça Del Vi — it’s probably a favorite! We stayed at the Placa del Vi Apartments, boasting a roomy two-bedroom apartment, complete with laundry! Since we were staying more than a few nights, we loved that there was a lovely kitchen and clothes washer. The kitchen was fully stocked with everything we needed to make a healthy breakfast and cocktail hour. :-) It also had a comfortable living room, with a balcony overlooking the town hall. All geared up to shop at the local markets in Girona! We really loved how the apartment was smack in the middle of the historical center, allowing us to walk to everything we would want. Curtiss was rather tickled when he found this locally made basket in the apartment that was perfect for going to the market. Along with the basket, Placa del Vi Apartments included a map to local markets where we could find the freshest produce — and we love to support local vendors. As you may know, many of our travels are driven by food, and the search for incredible dishes. 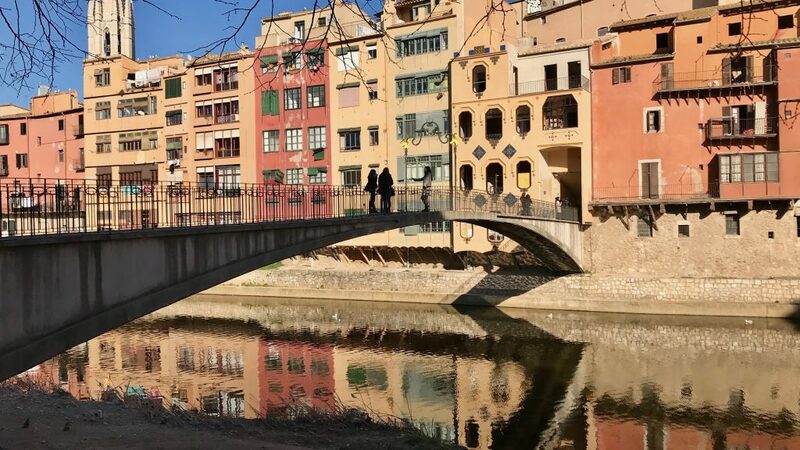 You can bet your bippy: Girona does not disappoint! Tapas are extremely popular throughout Spain; they are a great way to enjoy a sociable drink out with friends, in which you share small plates. We were delighted to start our stay in Girona with the Tapas & Wine tour by Night by Girona Food Tours. 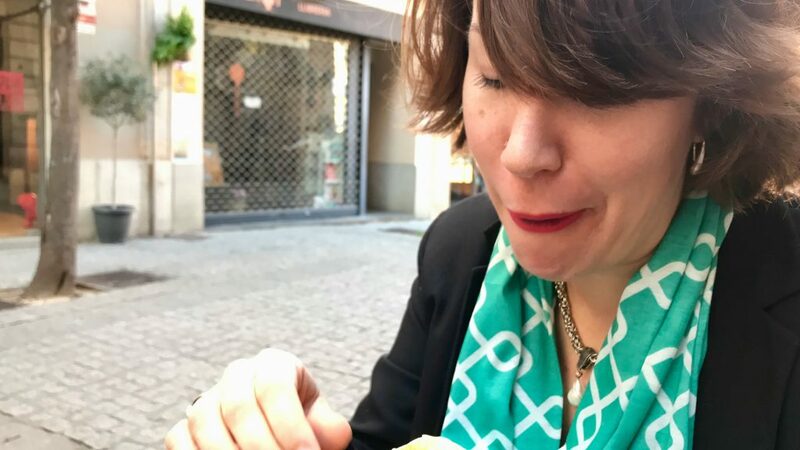 A few of the incredible tapas we enjoyed on the Girona Food Tour. Pat, our lovely tour guide for the evening, opened our eyes to some of the incredible local flavors of the region. Also, she brought us to some truly tasty family-fun restaurants, that we might have missed out on if we were not on the tour. Girona felt very walkable, especially the historical center. 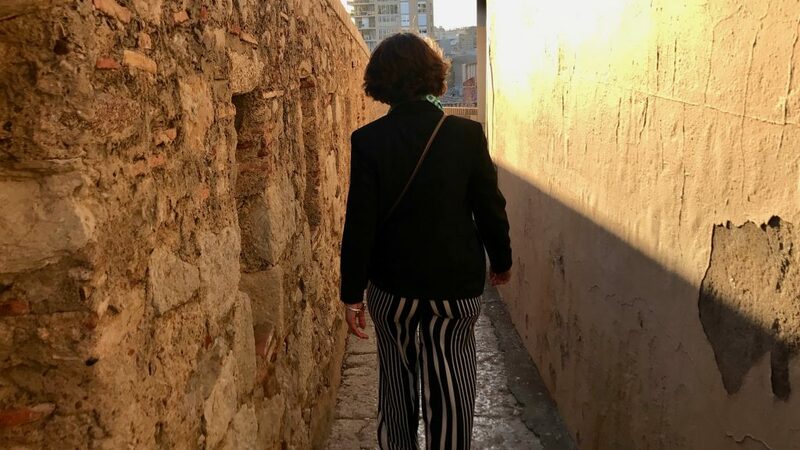 The narrow, cobblestone roads of the medieval city are great to stroll through. 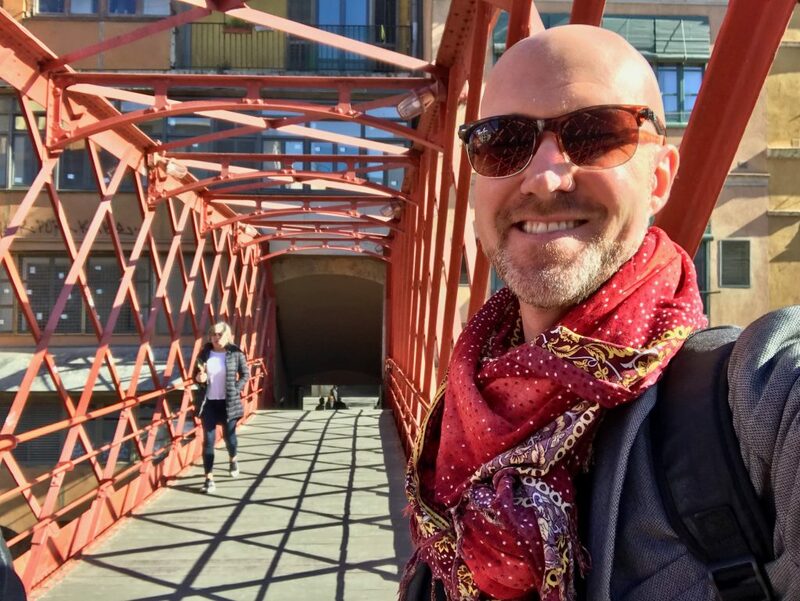 Of course, the various bridges are a great place to stop and admire the city and river. You can’t miss this iconic bridge designed by Gustave Eiffel. This bridge was designed by Gustave Eiffel, and it has quite a striking design that may remind you of the Eiffel Tower… for good reason. 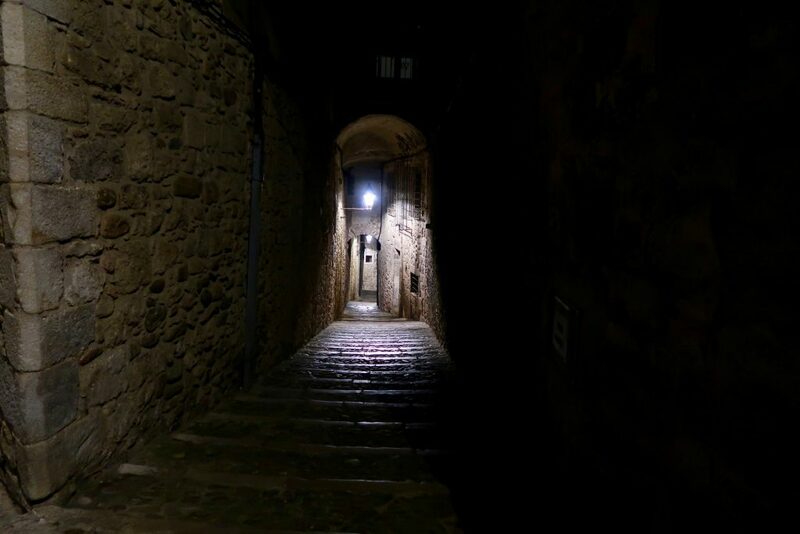 You’ll find hidden gems throughout the historical center of Girona. If you’re a Game of Thrones fan, you’ll recognize various settings from the sixth season. We were having a blast exploring the various twists and turns around the hilly cobblestone area where some scenes from Game of Thrones sixth season were filmed. Even if you’re not a huge GOT fan, the streets still capture your imagination. Something sweet for your sweetie? After walking around town all day, you deserve something a little sweet. Also: it is Valentine’s Day week, so of course it’s essential. We were told that there’s no better ice cream place in Girona than Rocambolesc. This very colorful gelato shop was created by one of the founders of the world-famous El Celler de Can Roca, which was named the best restaurant in the world… not once… but twice. With a bit of a “Wonka” theme, this exceptional gelateria and ice cream shop has a name of wild whimsy: Rocambolesc. Rocambolesc has some truly unique gelato flavors, and it was suggested that we could not leave town before enjoying a panet. Our mouths were watering, watching the panet being made — and it was incredible! A panet is grilled brioche stuffed with gelato and toppings of your choice. Crazy, I know! That’s why we had to try it! To create this gooey creation, they cut a brioche in half and then fill it with your desired flavor of gelato and toppings; then use a machine like a panini grill to seal the cold gelato inside a hot, toasted shell. This, my friends, is the look of pure, unfiltered love for food! To stick with the Valentine theme, we chose a strawberry and rose gelato with chocolate nibs and sauce for our panet. Do make sure to grab extra napkins; you’ll need them. Upon the ridge, a defensive wall stretches around a portion of Girona — here you will have the best views of the city! The best views of the city can be enjoyed from the Medieval walls surrounding a portion of the city. The various entrances may be a little hard to find, but once you do, it’s a lovely walk to watch the sunset. We were feeling the romance, as we watched the sunset over the Medieval streets of Girona! There are lovely hidden gardens around the walls — It’s such a cool place to get lost in! Near the wall, there are curious nooks hidden around the winding pathways leading to the stairs up to the wall. Here, we stumbled upon a sort of theater stage with a tree growing up through it. The gardens seemed like such a lovely place to relax. Cheers, with a glass of cold cava! We ended the day sipping a cool glass of local cava on our balcony. On the balcony outside our hotel-apartment, we savored some cava, and looked out over the plaza. 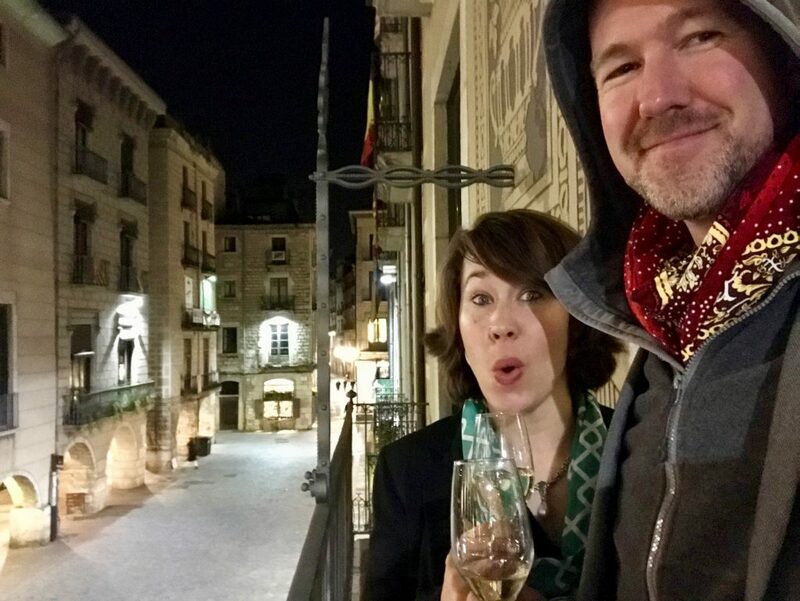 Thank you, Girona for an incredibly romantic Valentine getaway. We can’t wait to come back!